Do you find it a challenge to pull together the resources needed for your guided reading lessons? This resource includes everything, but the books! 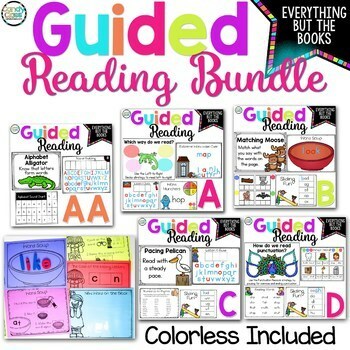 This all year bundle includes lesson plans, 30 reading strategies that come in poster and anchor chart formats, guidance on when to move students up a level, guidance on selecting books, brief word work activities, quick phonemic awareness activities, brief sight word activities, dictated sentences, assessments, visual student directions, during and after reading prompts, trackers, and so much more! For guided reading organization, easily set these up in a guided reading binder. The guided reading tools here will have you more than covered for these reading levels. Many of the activities are in a single page format, which makes this low prep! There is a little bit of cutting with some things, but I kept that to a minimum when designing this resource. Additionally, I offer options to print out letters for some of the word building activities, but you can also incorporate magnetic letters with the guided reading mats too. This resource includes both color and colorless options, so don't let the ink in the pictures scare you! There are options to print it without color on colored or plain paper for every single page. Save when you purchase the bundle! The individual sets adds up to $60, but save over 30% off with the bundle! 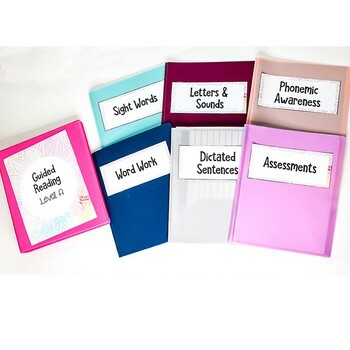 •Many editable pages in digital format such as editable sight word activities, assessments, lesson plans, and more! From guided reading word work to guided reading assessments, this guided reading unit will have you covered for these levels since it is jam packed with the 1,700 pages! If it seems like too much, you can also incorporate some of it in your guided reading centers or stations for students to work on independently too! For more details about this guided reading by level resource, please view the preview by clicking on the button under the picture that says preview. It breaks everything down more clearly. If you are having trouble viewing the preview, feel free to contact me at teachcandyclass@gmail.com. I will be glad to send you a copy of the preview.